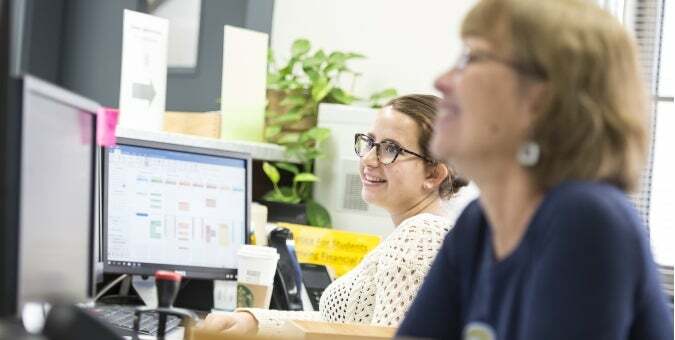 The Office of Student Records is the hub of communication between Kenneth P. Dietrich School of Arts and Sciences assistant deans, advisors, faculty, the Office of the University Registrar, and students. We provide the key information you need about the Dietrich School’s policies and procedures for graduation, transfer credit, reinstatement, internal and external transfer students, and the Dean’s List. Student Records staff can also answer questions about general education requirements, withdrawing from courses, grade options, and repeating a course. Additionally, student appointments with the Dietrich School assistant deans can be scheduled through Student Records. Records for the more than 10,000 Dietrich School of Arts and Sciences undergraduate students are managed by Student Records and are updated regularly with new academic reports, notes from deans, or other materials that show your progress while at the University. The Office of Student Records is open Monday through Friday, 8:30 a.m. to 5 p.m.
August 2019 graduation applications are now overdue. Please return your application by April 26 with a $25 late fee (cash, check, or money order). December 2019 graduation applications are now available. Please return your application by April 26 to avoid a late fee. Please note that the undergraduate Arts & Sciences application is not available online. You must pick up a hard copy in 140 Thackeray Hall. Please check with the Office of the University Registrar for diploma and final transcript mailing dates. How much do you know about the academic integrity policy? Avoid committing a violation by learning more through our online quiz.